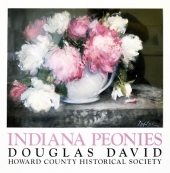 Shop for books and special gifts from or about Howard County. Search our amazing collection of historic images - and order a copy of that special treasure you find. Renew your membership - or submit a new membership - and be part of an exciting future with the custodians of Howard County's history. This limited-edition ornament features the distinctive, decorative balcony on the southwest corner of the second floor of the Seiberling Mansion. It’s the fifth in a series of collector’s ornaments, and the fourth to highlight the remarkable architecture of the mansion. $7.50 shipping and handling will be added during checkout. The beautiful "Peonies" painting, created by Hoosier artist Douglas David and now on display in the Seiberling Mansion, can be yours in this high-quality giclee print. All orders will be available approximately two weeks after ordering. Your print will be delivered by standard mail (rolled in cardboard tube). A $7.50 fee for shipping and handling will be added at checkout. If you prefer to avoid shipping charges, you may order, pay for and pick up your purchase at the museum office. The Howard County Interim Report is a 108 page paperback publication. The interim report is designed to be utilized as a working document by government agencies, local organizations, and private citizens as a basis for a variety of projects. The book is a result of a county wide property inventory that identified historic districts and buildings that are eligible for listing on in the National Register of Historic Places. The Kokomo Tribune and the Howard County Historical Society believe that offering a pictorial publication of the county is a natural extension of our joint efforts to record events and to reflect upon the activities of the pioneers who shaped the area’s early history. This photographic chronicle offers glimpses of varying segments of life in the early days of Howard County and illuminates values, work ethics, traditions, and beliefs that were held dear by those who helped to make Howard County the community it is today. It’s hoped the photos here will enlighten people about Howard County prior to 1940 and -by merely turning pages- step back in time. We express our gratitude to the many individuals and organizations who donated these priceless photographs to the historical society for posterity. This project could not have been completed without the generous contributions of many individuals and organizations who donated these gems.